I was sailing to one of me favorite spots of the ocean. I knew these waters so well that I could steer the helm with me eyes closed. The winds were favorable and the ship steadily moved towards the south. The lads were upbeat and there was almost a carnival on the deck. Our destination for this voyage was a place called Punjab Grill. Those big lion faces on the entrance always fascinated me. The time to discover what lies beyond those gates is upon us. What lies ahead...well read on mate. The Lions beckon you inside. They literally do. 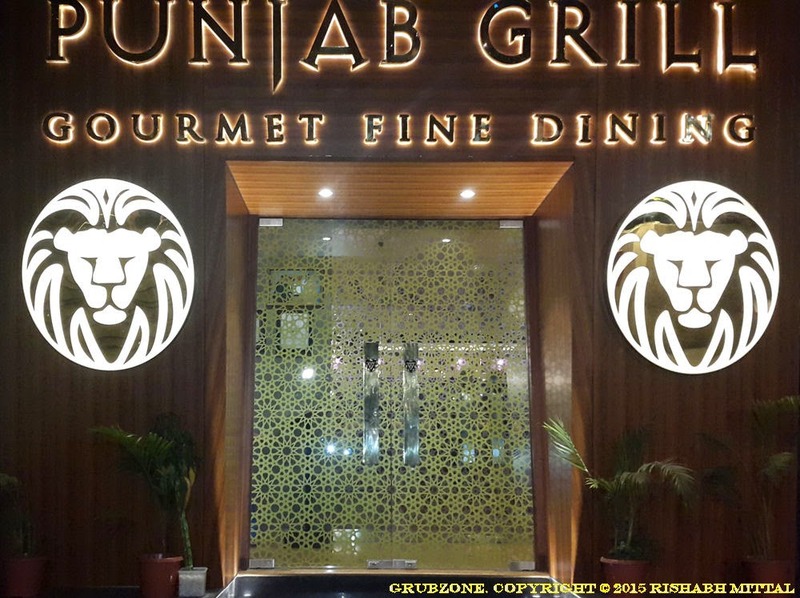 I have seen other branches of Punjab Grill in far off malls. Those lit up lions have always fascinated me. I have been curious about what lies beyond those gates for a long while. And as the universe would have it, I received an invitation from Food Bloggers Association of India to join in for a "Connoisseurs Experience" over here. Punjab Grill without a doubt has one of the most impressive facades that I have ever seen. 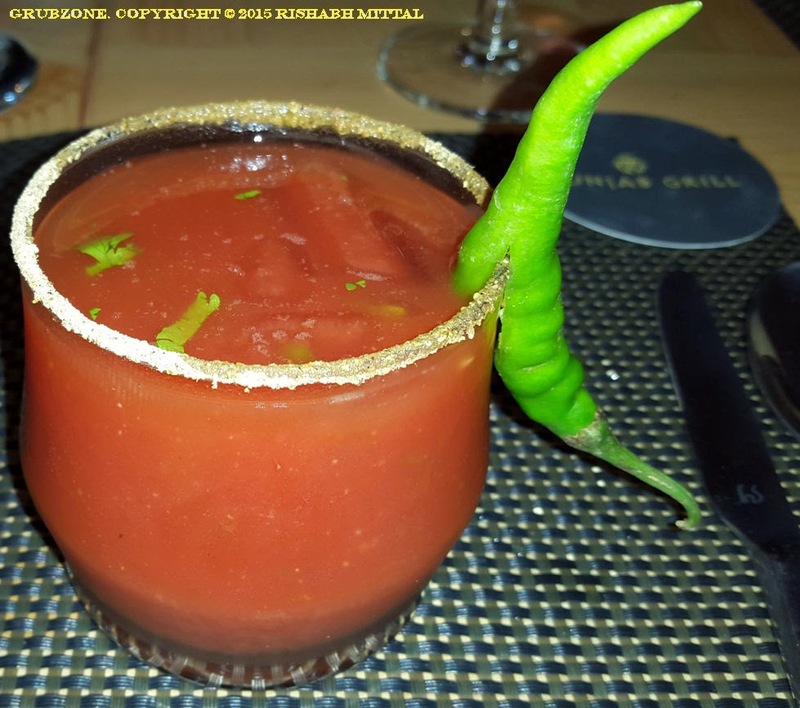 In a world where people judge a book by it's cover, Punjab Grill enthralls the viewers completely. In fact, one can even hear an adult Simba voice calling you inside in a jovial Punjabi accent. "Oye, come inside." Well I finally opened those doors as I walked into the gleaming golden light of this Punjabi Safari. I was welcomed in by two smiling hostesses who appeared to be genuine with their emotions. I have had frightening memories of Air Hostesses smiling at me when their mood was clearly not happy. The restaurant has a moderate sized dining area with a Bar-lounge and a main dining area. The lounge appears quite special with its artistic lamps and mesmerizing artifacts. Though the lighting isn't your typical dim dark types, the lounge does well to blend in Punjabi themes. The main area has comfy looking seats and a very family themed atmosphere. Under the Golden lights, its easy to enjoy the meal with some light talk. A special table was set up for our group within the lounge and it felt quite awesome to have that lovely lounge all for ourselves. 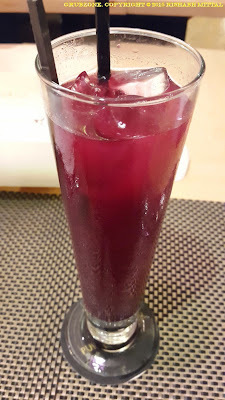 Jamun Ice Tea is a house invention. 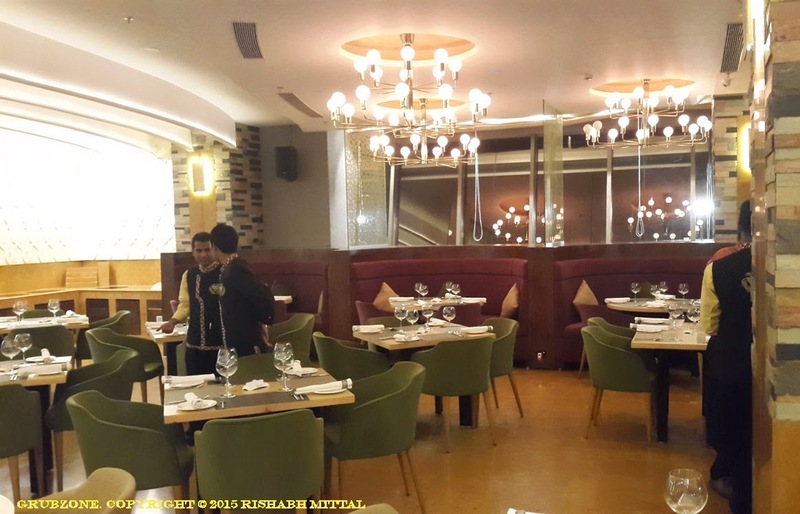 Its a time when restaurants are busy fusing Western and Desi cuisines in hopes of coming up with a legendary creation. Punjab Grill is up on their game with this. The distinct sweet and slightly bitter flavor of Jamun dominates the taste. Indian Spices and tea give it depth making it more of a Jamun Masala Ice Tea. This is definitely a first time for me. 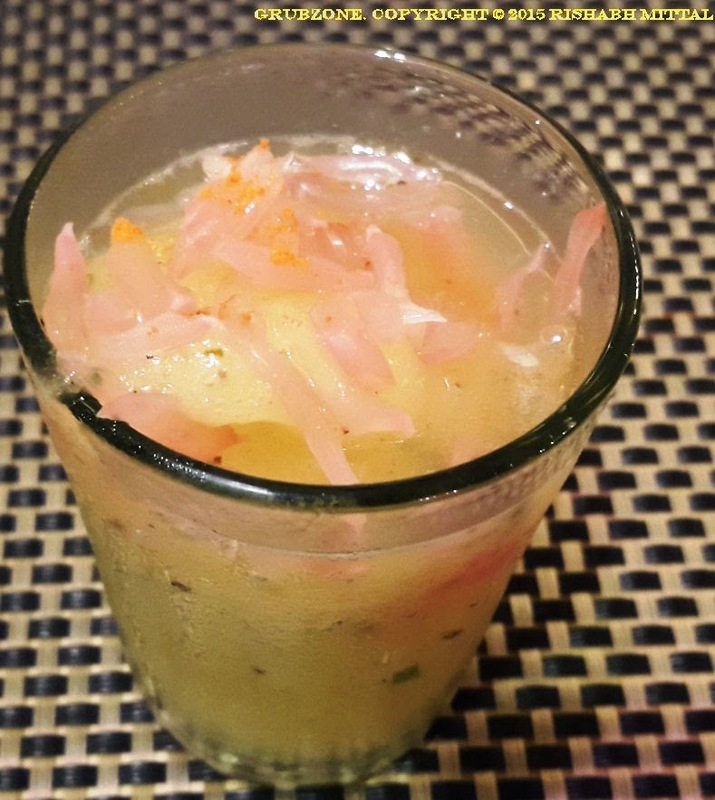 A true Punjabi fare needs a real drink. And hence came in the Bloody Mary or as Punjab Grill likes to calls it - Bloody Chameli. Again breaking convention, this was served in a short glass instead of a high ball and the Chilli really put a Desi touch to it. Although, its shape made it resemble a tomato with the chilli resembling the green on top. The Tomato and Tabasco were strong on this and I felt that the Vodka was mild. Pickled Olive Bhel is a Western Twist to a Desi special because it gets boring to give Desi Twists to Western dishes all the time. A little Bhel background over here - I dislike it completely, abhorring it most of the time. 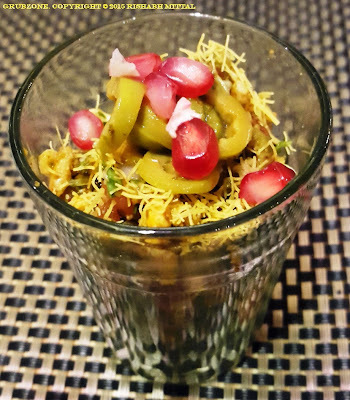 However, this Bhel was different. It was Bhel by taste but somehow it didn't repulse me. The pickled Olives were sour and tangy. This gave this old staple a new dimension. A true twist of taste. Captain : This is good. Savory. Crewmate : You meant Savvy right? Captain : Do I look like Jack Sparrow to you? 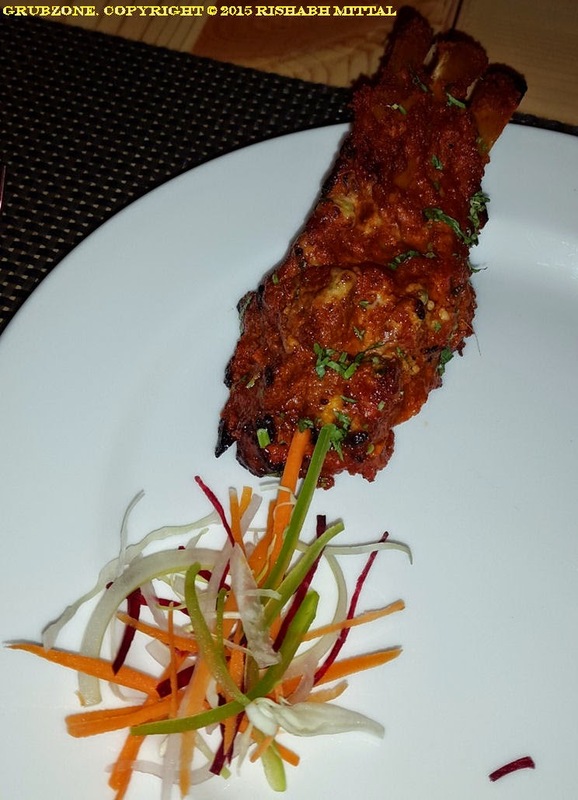 Tandoori Guchchi is a vegetarian appetizer that could be given to carnivores when they are abstaining from meat. 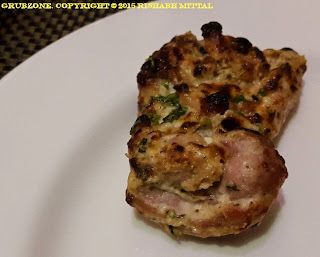 Using the prized French Morchella mushrooms in a Punjabi Tandoori twist is quite a bold step. But boldly going where no man has ever gone before does have its rewards. Having the sponginess of Paneer, these mushrooms tasted great on their own. The flavor of the sauces and spices had gone down quite deep. It also goes well with the dressing provided. Its a shame that I didn't go for seconds for this. The smell, the flavor and the plating were all splendid. 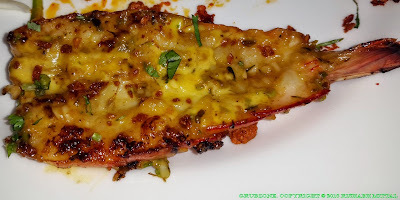 Captain : This is a great Paneer with spices. Crewmate : Its actually Guchichi or Morel Mushrooms. Captain : Wow, that would make a good Paneer too. Murg Malai Tikka was almost a perfect preparation. The meat was just the right rare and the flavor was present uniformly in and around the meat. The salty - tangy flavor would pamper my taste buds while the meat would literally melt in the mouth. I may be a bit biased here as I love this appetizer and I have had it too many times to remember. But then that means a lot when I say that it tasted so well. Norwegian Salmon Tikka was one of the highlights of the day. 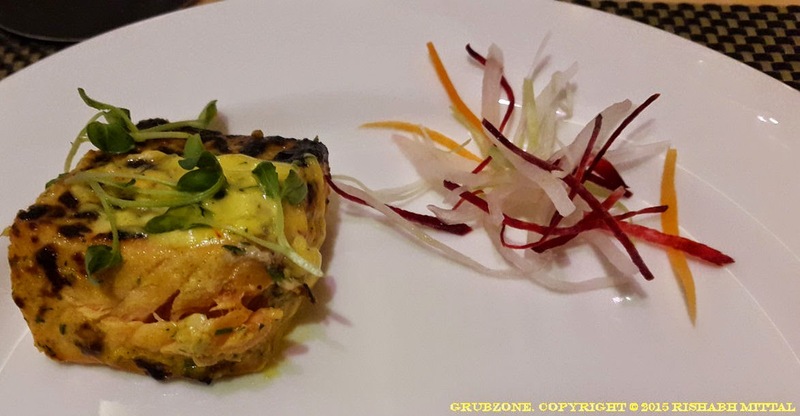 Extending the popular recipe of Norwegian Salmon to a Tikka format was a move well played. The kebabs were marinated with spices and served with a dollop of Saffron Aioli. The meat was medium rare by text book definition. The Kebabs were super soft and would break easily. The flavor of the Salmon combined with the spices and the tangy-savory Aioli was something that won over everyone. It was a hot Desi experience while sailing the cold Norwegian Sea. Captain : We should sail to the Norwegian sea just for this. Crewmate : If you liked it that much, we could just come here again. Captain : Ah, that works too mate. Tawa Grilled Prawns was a pan fried prawn dish. Personal experience suggests that pan grilled prawns usually tend to be a little dryer and more crunchy. While the well cooked Prawn flesh went great with pickled Lemon marinade, I did feel that a little more peeling would have been nice. The thin shell was difficult to remove after being cooked and became a bit of an annoyance. I am no expert in Prawn recipes but I do favor peeled and deveined prawns. Chaamp Taajdar was a tri-bone meat lollipop. The meat was succulent and flavorsome with spices blending in quite well. But I did feel that uniformity had a slight problem here. The meat was uneven and was difficult to extract from some regions of the bone triplet. From some areas it would come off quite well while some others ran a risk of chewing thin bone off. Since the marinade had drizzled over the extending bone as well, it was a bit messy to eat this little morsel. 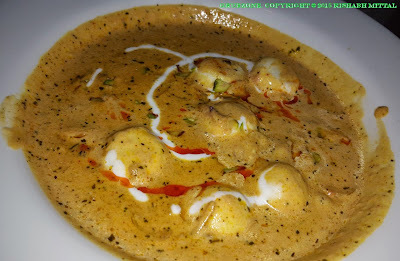 Paneer Malai Pede was perhaps the best Paneer dish that I have ever had. I am not saying this lightly. The Paneer was made in an unorthodox way and as a result it was almost like a "Peda" or "Modak" made out of Paneer. The small soft paneer balls would melt in the mouth leaving an aftertaste of cream and spices behind. The consistency was unique. Never have I found Paneer that tastes like this. I found myself swooning to the absolute delight that this dish was. I could shout from the rooftops or hilltops rather that this was great. Captain : This looks like a yellow universe with Soft Paneer stars and spicy planets. Crewmate : And I feel like Galactus devouring this cheesy universe. Captain : It feels great to have Galactus scrub the decks for me. Rarhya Meat was an average fare. While the dish appeared great in appearance, I found it a bit too oily for my liking. The curry consistency was not thick enough either. It felt more like a thick soup than a curry. 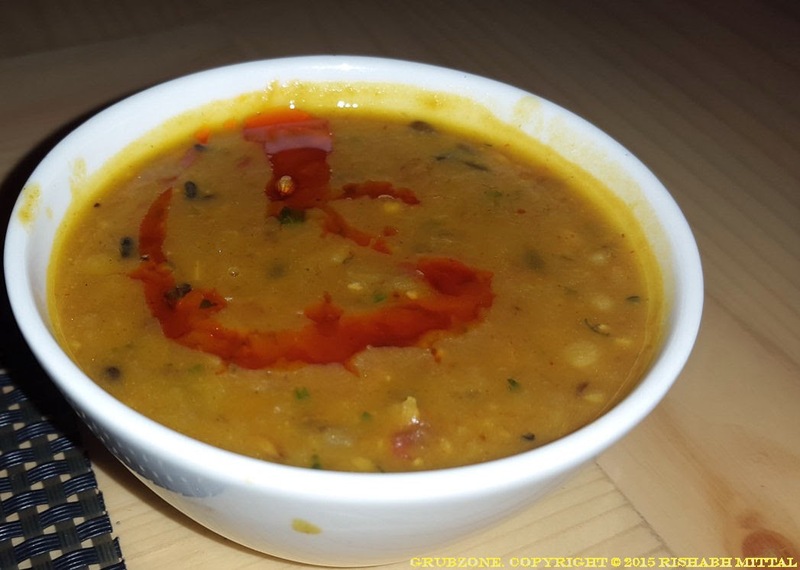 Dal Panjratni is usually made of five different Lentils. Though the appearance indicates the dominance of one lentils with minor aesthetic additions of the other four, the taste resembled the common Dal Fry found everywhere with a bit of homely spicy flavor. 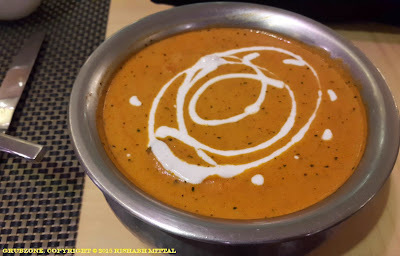 Punjab Grill's Butter Chicken suffered from what I call as a "Tomato deluge". This happens in quite a few Punjabi/Mughlai serving places. 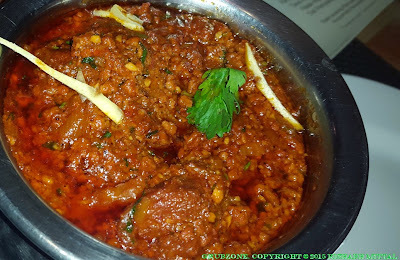 Butter Chicken is one of my favorites and a dish that I have had in several dozen different restaurants. The tomato puree should usually be balanced to prevent it from overpowering the flavor. Over here the gravy didn't even feel that it belonged to a meat dish. The creaminess felt lacking, the savory salty flavor was absent - The Tomato had conducted a hostile takeover of the flavors. Captain : This Dish is too much of Tomatoes. Crewmate : Is it more than the tomato in your Bloody Mary? Captain : Its more than the tomato in La Tomatina. Mango Sorbet with Pomelo was somewhat of an intermediate dessert served to us as our main dessert was under preparation. While I loved the sweet-sour Mango and Pomelo liquid, I wasn't entirely fond of the onion like strands and spices at the top. They felt like a mismatch to an otherwise great invention. Almost like Jack Black appearing on the cast of "The Expendables". 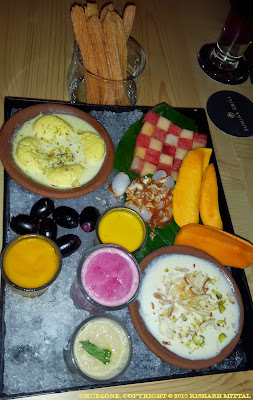 The Summer Dessert platter was a mix of fruits, caramel, Special Churros and Desi treats. While I enjoyed the visual aspect of it, I did feel that it had a bit of a "Jack of all trades" thing to it. It is a new item that is being added to the menu for Summers only. The theme does play well with the fruits. The Litchi with caramel sauce tasted quite great. The Churros which were made out of Jalebi flour were clearly the highlight of the platter. Although dipping them in mango puree and Raas Malai did feel odd. I felt that a flavored Lassi shot in the platter would have done wonders for the Punjabi theme. Captain : I am confused lad. This looks beautiful yet a bit unsatisfying. Crewmate : I quite like the Churros. Captain : Oye, save some for me or I am tossing you overboard in the high seas. This Punjabi voyage reached its end with the Paan shot. 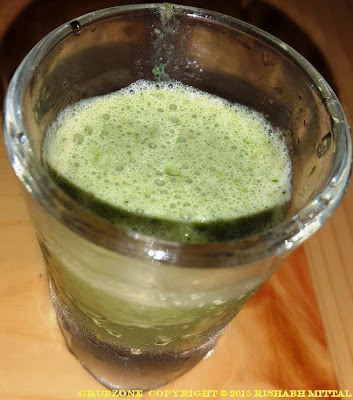 This was a sweet minty Paan drink which acted as both a palate cleanser and a mouth freshener. I quite enjoyed it and would have loved to have more of it. 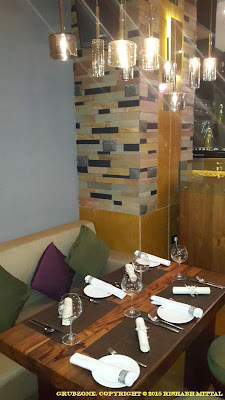 The service was good with the servers accurately describing each thing as they served us. And they were quite co-operative for the pictures. Though, one does feel that there is room from improvement. Punjab Grill feels a bit pricy for the entrée menu while the mains tend to be priced somewhere between a Zaffran and the run of the mill Mughlai restaurants. The starters are really great but could very well do better with a slight pricing shave off. To wrap this up, the Appetizers were great and their inventions worked well for the most part. Their mains felt a bit lacking with the exception of the Malai Paneer Pede. For a Carnivore like myself, this is could be a peeve. The ambiance is one of this establishment's greatest strengths. It seems to have been done in a very loving and tasteful manner. If the facade impresses you then the interiors will live up to the excitement. 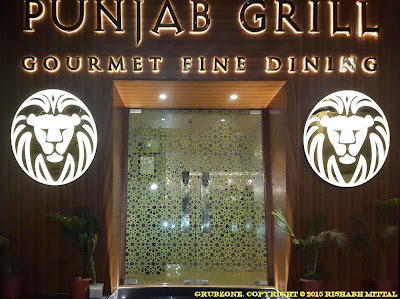 Even with the flaws, I very much enjoyed the Punjab Grill experience and do look forward to trying their mall outlets as well. "Oye Lads, time to go back to the winds. The Leo constellation awaits us."